Sedona is known for its one of a kind sunsets, each one a unique and powerful experience. You'll want to make sure you have a good seat to watch as the sun dips below the horizon and the landscape becomes aglow with a dreamlike palette of colors. There are plenty of magical spots to retreat for sunset; here are just a few suggestions you might want to consider. Imagine soaring high above Sedona with a bird's eye view of the beautiful Arizona sunset as it lights up the entire Sedona landscape with a full spectrum of colors. Well, it is possible! If you are willing to pay the extra buck, you can hop on a plane, helicopter, or hot air balloon for an unbelievable sunset ride that will lift your mind, body, and soul. Cathedral Rock is perfect for sunset. If you climb up to the saddle at the top of Cathedral, you will have a perfect view of the setting sun in the west, as well as the beautiful colors reflected in the eastern landscape. You can either take a jeep tour up Schenbly hill or if you have access to an SUV you can drive yourself. The rocky dirt road takes you all the way up to the Mogollon Rim, where you will find beautiful panoramic views of Sedona at sunset. Being near water at sunset can provide you with some great photography opportunities. 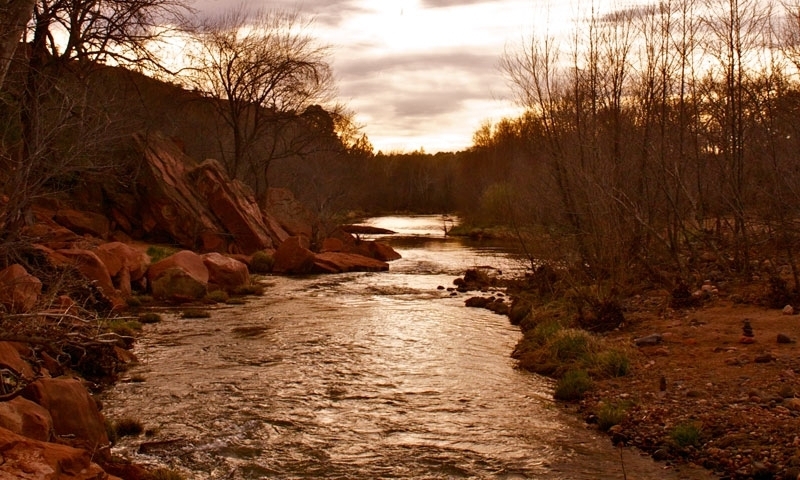 Enjoy the peaceful flow of Oak Creek and marvel at the colorful reflection of Cathedral Rock in the water as the sun sinks below the western horizon. Airport Mesa offers great views West Sedona at Sunset. But even more intriguing Airport Vortex, which you will find halfway up Airport Road. Here you will get more of a 360 degree view of Sedona so you can experience the all around magic of the colorful landscape at sunset. Airport Mesa is a great place to go if you are looking for somewhere that is easily accessible by car; but if you are looking for peace and privacy, you may want to try somewhere else, as the mesa can get rather crowded at sundown.